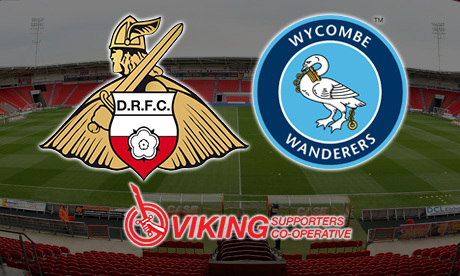 Grant McCann is set to take charge of his first competitive home league game this Saturday, as Rovers welcome League One new boys Wycombe Wanderers to the Keepmoat. "First and foremost, we must match their energy, they're a very energetic team - especially in midfield so we have to make sure we match than if not better it. "They're a very strong team, Gareth's done an outstanding job there to move them to League One with very limited resources but they're a threat, they have threats all over the pitch without naming anyone but we have to make sure we nullify them but make sure out threats can hurt theirs. "Home form is key - if you want to have a promotion season then you have to be picked up as many points as you can at home. It would be wrong of me to say you have to win every game at home but we want to make sure we have a huge chunk of wins here this year." Rovers will be without new signing Ali Crawford, who picked-up a recurring knee injury in the 3-2 win over Southend, meaning he won't be able to make his Keepmoat debut. MCann refused to put a timescale on the 27-year-olds recovery. The Chairboys will be bringing former Rovers striker Adebayo Akinfenwa back to Doncaster, who featured nine times for the club in 2004, scoring four goals during that time before moving away to Torquay. At the age of 36, Akinfenwa is still going strong, netting 29 goals in 82 appearances under Gareth Ainsworth. Wanderers have a new number one in town, Ryan Allsop who joined on a permanent deal from Premier League side Bournemouth, after originally being on loan from the Cherries in 2016, where he made 18 appearances. Most recently, Allsop has had spells at Blackpool - where he guided them to promotion out of League Two - and Lincoln City where he won the Checkatrade Trophy. The last time Rovers and Wycombe met was in League Two during the 2016/17 season, where Ferguson's side failed to beat the Chairboys on both occasions, drawing 2-2 at the Keepmoat before losing 2-1 at Adams Park that April. In fact, Rovers have never beaten Wycombe in their history out of the five times they have faced each other.